Many animal rescue organizations successfully partner with prisons, allowing inmates to train, or simply spend time, with animals on a regular basis. An Ohio rescue group claims this was not the case for Evie, a foster dog they say was killed while participating in a prison program last month. Animal rescue non-profit Joseph's Legacy, based in Middletown, Ohio, wrote in a Facebook post Sunday that 4-year-old Evie was killed while in the care of Warren Correctional Institution. "Evie was found in the cell, unresponsive by her handlers and she had passed away," the organization wrote. 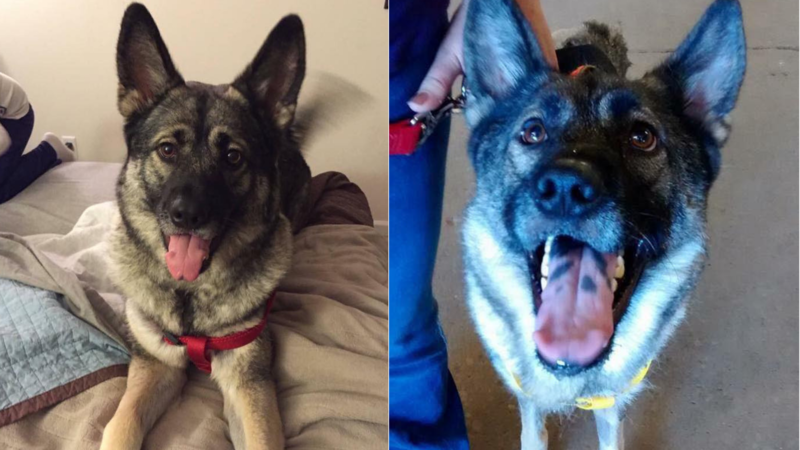 The necropsy, or animal autopsy, revealed the German shepherd/Norwegian elkhound mix died from blunt force trauma to her abdomen, according to the post. "We're all undeniably angered and overwhelmingly upset," the post continues, "We have to get justice for Evie." Lisa Cantrell, secretary and board member of Joseph's Legacy, told CBS News Evie died Aug. 25, but the group just received the autopsy results this weekend. Joseph's Legacy says the program was put in place for "troubled dogs" to get extra training, to get them ready for placement in their "forever homes." Cantrell told CBS News they have been partnered with the prison for about a year and had about 20 dogs successfully "graduate" and adopted into their forever home. The non-profit explains they regularly sent volunteers to the prison to observe the dogs' progress, as well as their handlers. The group says they have pulled all dogs from the program following Evie's death. Evie first came to the rescue in 2015, states the Facebook post, suffering from a broken hip after being hit by a car. The dog had recently given birth to a litter of puppies. "She was a super mom. We had to help her, give her the life where she didn't have to worry about what the next meal was for her or her babies," the group said. Joseph's Legacy took in Evie -- and her puppies -- providing her a necessary hip surgery. While one puppy did not survive, the other was adopted. Evie was adopted as well, but returned "at no fault of her own a few months ago," explains the non-profit. They said she learned how to open doors and other ways to escape a home, so they sent her to the prison program for more training to make it "safer" when she was adopted again. Sadly, she will never get that chance. The group warns other rescue organizations of prison programs, writing, "These programs are more risky than we had originally thought. Please use our Evie as an example to think twice if you are in a rescue considering these types of programs. We know it's not everywhere but please keep Evie in mind." The group also says they plan to press formal charges against those responsible. The State Highway Patrol is investigating the death. Following the patrol investigation, the Ohio Department of Rehabilitation and Correction will hold its own investigation at the prison, as well as review animal programs at other prisons, JoeEllen Smith, a spokesperson for the Ohio Department of Rehabilitation and Correction, told The Associated Press. "The animal training programs within our facilities have proven to be an effective and meaningful activity for over 20 years, and we have absolutely zero tolerance for any type of abuse of the animals who are part of these programs," Smith said in a statement.